Mark Howes has a goal: "To produce moderately priced and well made working cowboy gear." Howes has been around cattle and horses all his life. As a boy, he spent summers wrangling on a dude ranch in Grand Lake, Colorado. The ranch had lots of old saddles needing repair, and Mark was given the "opportunity to fix them." Without any assistance, he tore the saddles apart, made the necessary repairs and put the pieces back together. From the dude ranch, Mark went on to work several cattle ranches. He developed a feel for the function of the gear used by horsemen and cattlemen. With his understanding of the relationship between horse, gear, and rider, he began creating his own equipment. Later on, he left the cowboy country to enrich his artistic abilities with schooling in the arts. He graduated with a Bachelor of Fine Arts degree and continued his studies in Europe and later Australia. As so often happens, the ranching life called him back, and, in 1976, Howes became foreman of his in-laws ranch near Kaycee, Wyoming. He purchased adjacent land and went on his own in 1982. Throughout these years he continued his leatherwork and sculpting when time allowed. His life on the ranch provided the inspiration to create sculptures of life in the West. He began to be noticed for his creative talent, and custom orders for saddles and sculptures flowed in steadily. As time went on his leather work became the main family income, so, in 1986, he changed occupations. He sold the ranch and most of the livestock and moved his wife and three boys to Fort Collins, Colorado, where he opened a custom tack shop specializing in old-time working-cowboy gear. Howes now has a flourishing saddle business, and has recently embarked on a new venture - LaPorte Forge Horse Brand Bits and Spurs. The Ranch Roping Association was formed by Mark Howes and other close friends to promote practical roping skills, good horsemanship, cattle handling, and groundwork. 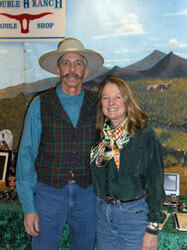 For more information and ranch roping events please visit, www.RMRRSHA.com. The clinic was designed for horseman wanting to develop roping skills and horsemanship in a low-stress stock handling environment, to work as a team for doctoring cattle. The clinic was conducted by Mark Howes and Jim McKinney who have extensive experience roping and stock handling. Pictures from the ranch roping clinic are posted below. Heath, youngest son of Mark and Linda, has been working in the shop since 2009. He makes some of the saddle trees used in the shop, through his company Chicago Stockyard Saddle Tree. He likes to act in the local Community Theatres when he can and teaches acting in the evenings. Jake has been working at DHRSS since May of 2013. Most of his background consists of being a working cowboy. Jake has working on ranches and feedlots that span Wyoming, Nebraska, Colorado, and South Dakota. 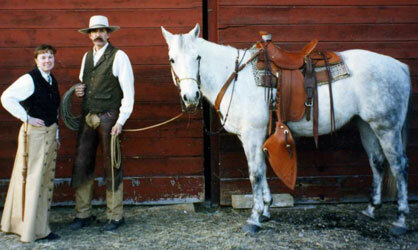 His influence in the California/Vaquero style of horsemanship, stockman ship and gear started at a young age. Jake spends his spare time riding, competing in the RMRRSHA, and day working for friends and family.